Keenly priced, gorgeous-sounding EQ and compression, and all without the Guitar Rig wrapper. CPU-efficient native plugins. Great sound all round. Quite rare compressor design. M/S mode for Passive EQ. Competitive bundle pricing. Last year, Native Instruments introduced a range of impressive classic emulation plugins, including the SSL-influenced Solid Mix Series and the Softube-designed Vintage Compressors. However, many, including us, were slightly peeved that you had to run them within NI's Guitar Rig plugin shell. Well, the good news is that its latest three plugins not only see the firm collaborating with Softube again, but also ditch the Guitar Rig coat in favour of regular native plugin formats (AU/VST/RTAS/AAX). "What we essentially have here is a mastering-grade 4-band, 2-filter passive EQ; a high-end variable-mu compressor/ limiter (Vari Comp); and a Pultec-style passive EQ (Enhanced EQ)"
The Premium Tube Series comprises three plugins: Passive EQ, Vari Comp and Enhanced EQ. These aren't labelled or endorsed as specific hardware emulations, but the control parameters indicate close similarities with three popular Manley units. So, what we essentially have here is a mastering-grade 4-band, 2-filter passive EQ; a high-end variable-mu compressor/ limiter (Vari Comp); and a Pultec-style passive EQ (Enhanced EQ). Each plugin is available separately or with the others as a competitively priced bundle. The plugins share the same rather drab grey and purple graphics, and include A/B memories and task-specific presets. In case you're not familiar with the hardware these plugins emulate, we should sum up the main features. The simplest is the Enhanced EQ. This 3-band passive EQ design includes low shelf, high bell and high cut, and all frequencies are notched. It appears to be based on the Manley Enhanced Pultec EQP-1A, which itself is Manley's interpretation of the classic original Pultec units built by Pulse Technologies. Much like the Manley hardware version, the low-band frequencies of NI's Enhanced EQ differ slightly from a real Pultec unit. This basic EQ design is then super-sized into the Passive EQ, which looks suspiciously like Manley's revered Massive Passive. It features four bands in parallel configuration with notched frequencies and sweepable bandwidth. Each can be switched to either bell or shelf, and in the case of the latter, high Q results in an overshoot shape. Rounding things off are high- and low-pass filters. The Vari Comp looks pretty simple, but is a tad esoteric in its labelling. Notable features include the five 'Recovery' (or release) settings, individual dry level (for parallel compression) and sidechain gain. The inclusion of both input level, threshold and output level makes it easy to saturate the processor circuit. "Although all three plugins are pretty easy to get to grips with, they each include 20 or so task-orientated presets"
Although all three plugins are pretty easy to get to grips with, they each include 20 or so task-orientated presets. These range from typical Pultec-type jobs (bass, kick, snare, guitars) for the Enhanced EQ to mastering bus and submix presets for the Passive EQ and Vari Comp. 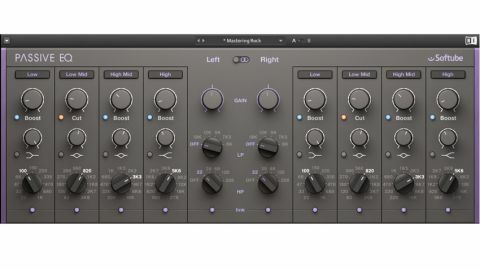 Putting the EQs through their paces reveals exactly the sorts of sounds you'd expect from Pultec-style processing - in fact, switching these plugins in feels good even when they're flat. The Enhanced EQ's high-frequency band imbues the top end with great sweetness, and with its narrowest setting being quite broad, even a total novice would struggle to mess things up with it. The low-frequency shelf is gentle and great for adding depth to pretty much anything, including full mixes. If you do want to tighten things up by scooping the low mids more than it might seem the plugin makes possible, you can always wind up the low-frequency cut in tandem with the boost. The Passive EQ is a paragon of flexibility. It's excellent as a master buss EQ, and once again, even at high settings, you really don't feel you're ever going to do any damage to the signal. Although experienced engineers generally cut with EQ rather than boost, if you are going to boost, this is the sort of EQ to use. And when you push it harder in the harsher upper mids, you get a beautiful, subtly saturated sound. The Vari Comp is rather different to the EQs in its modus operandi, shifting from subtle to blatant with only small changes to the Threshold or Attack/Recovery settings. The Limit setting is the one to go for if you're after big, fat drum kit processing, while for gentler master buss duties, try the softer Compressor option. We also like the Detector HP (high-pass) and Dry blend control for finessing mix buss compression. The Premium Tube Series is up against some pretty stiff competition, and we already have several choices for Pultec EQP-1A-alikes, from Waves, IK Multimedia, PSP, UA and others. The Enhanced EQ certainly performs well alongside all of these, though. The Passive EQ has less competition, but we did A/B it with UA's Massive Passive - the results were pretty much a dead heat in terms of sound quality. Overall, NI and Softube have done a great job here, and although we've seen many EQP-1A style emulations before, multiband passives are less common. The variable-mu design is less common still, and it's great to see all three in a fully native form, free from any proprietary system such as Guitar Rig or the UAD format.